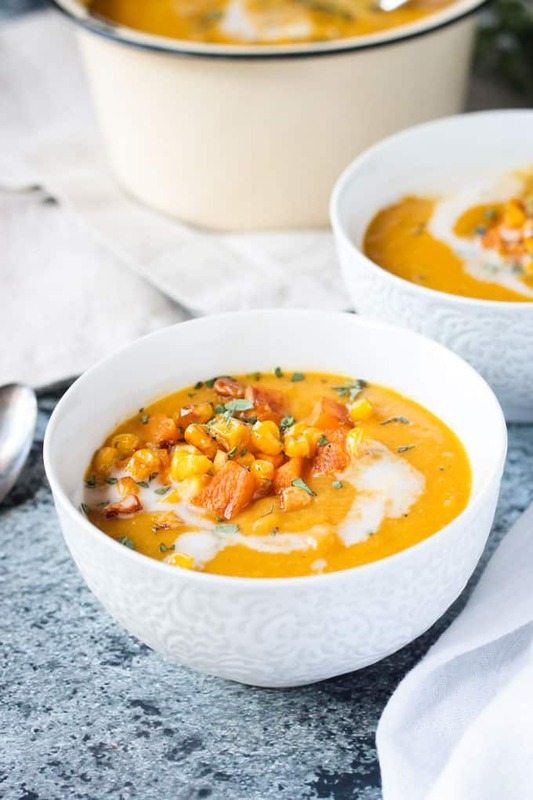 Vegan Butternut Squash Soup w/ Corn – incredibly flavorful with simple ingredients, this cozy soup will have you coming back for seconds. Silky smooth creamy soup base with no absolutely no dairy. You won’t believe how good this is! The temperatures dropped, we turned off the air conditioning, and out came my cute boots. And, of course, I got allllll the cravings for cozy soup! 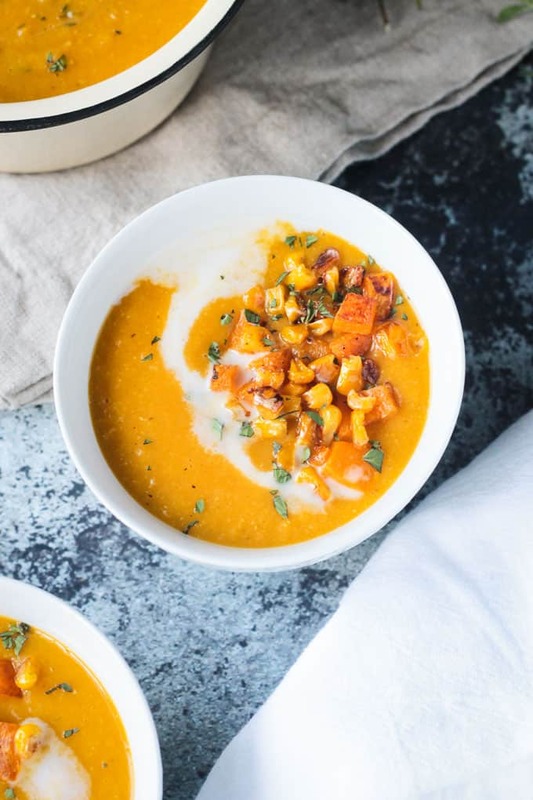 This Vegan Butternut Squash Soup w/ Corn might be my favorite soup recipe yet. It’s such a delicious combination of flavors. It has a hint of sweetness from the naturally sweet corn and squash which balances nicely with savory fall herbs like sage and thyme. Butternut squash boasts vitamin A, vitamin C, fiber, B vitamins, potassium, folate, vitamin K, omega-3 fats, and much more! 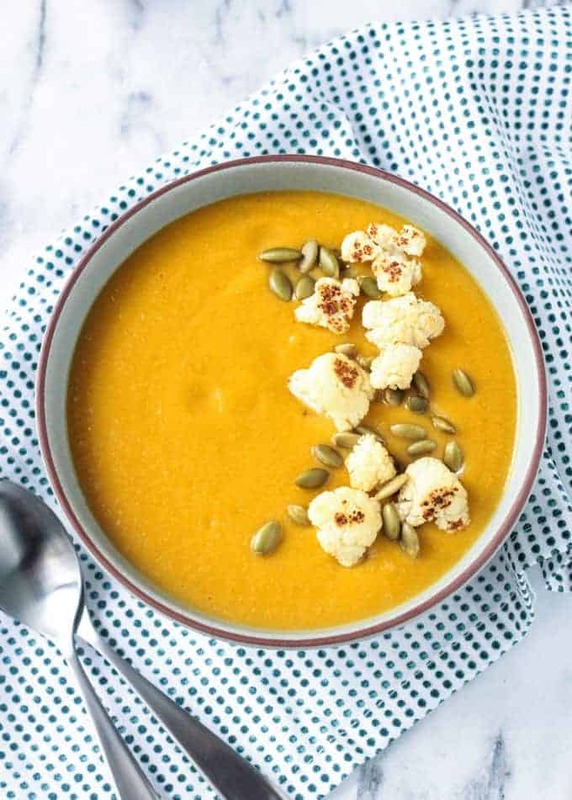 If you need more ideas for getting butternut squash into your diet try these: Butternut Squash Apple Soup (similar to Panera’s Autumn Squash Soup), Quinoa Salad w/ Spinach & Butternut Squash, Slow Cooker Black Bean Butternut Squash Chili, and of course my world famous Butternut Squash Mac and Cheese! Corn sometimes gets a bad wrap as far as nutrition goes, but it absolutely can be a part of a healthy diet. Corn has B vitamins, phosphorus, potassium, fiber, and antioxidants. If you’re worried about GMO’s ask your local farmer how they grow their corn, make sure to buy fresh organic corn, or used organic frozen sweet corn (<- I have this in my freezer all year long!). I love this article from Eating Well debunking some common myths about corn. 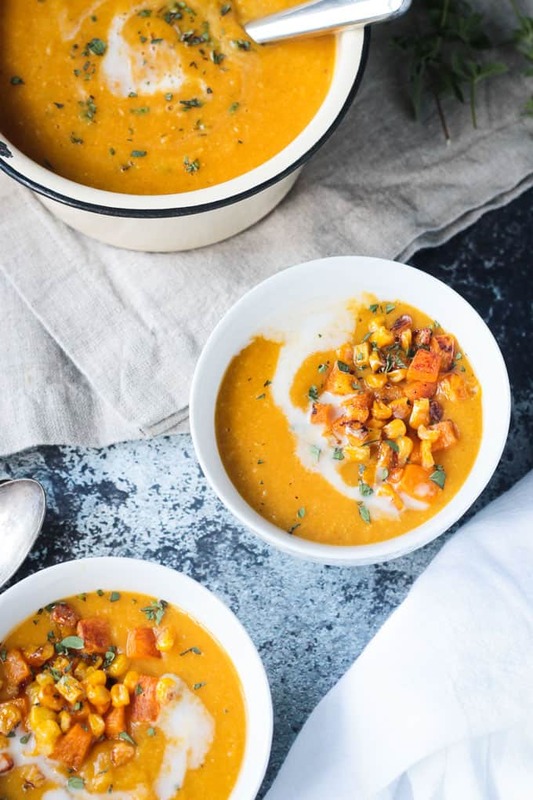 Butternut squash is such a versatile vegetable. It can be roasted, baked, boiled, mashed, puréed. 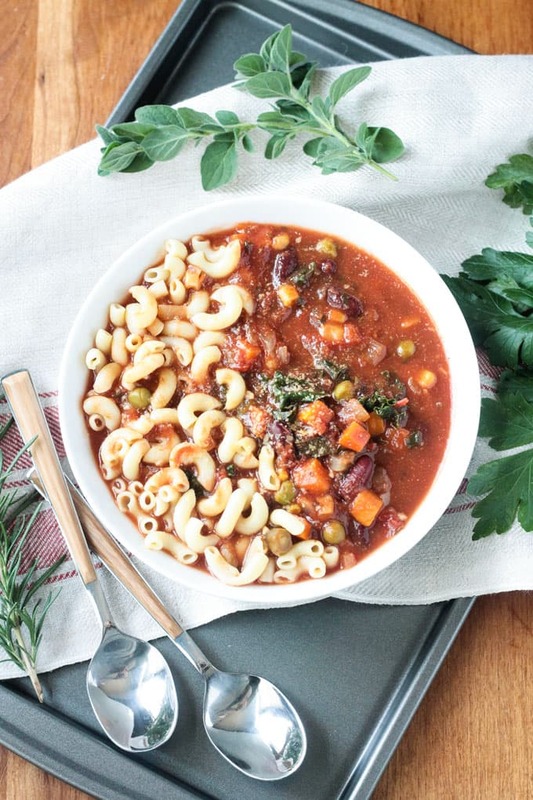 It’s wonderful in soups, stews, salads, pasta, curries, buddha bowls, and casseroles. I even use this yellow winter squash in sweet recipes. Check out my Cinnamon Squash Bread w/ Cinnamon Squash Icing for a super yummy fall treat! I wasn’t sure if they would like this soup or not. They love my Butternut Squash Mac and Cheese, but they don’t love to eat roasted cubed squash. I was thinking it could go either way. Well, I’m happy to report they love it! Not only did they love it, but two of them requested it in their lunch boxes the next day. 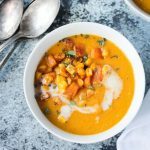 AND when I made dinner the next night they all said they would have rather had leftovers of this Vegan Butternut Squash Soup! How’s that for an endorsement?! 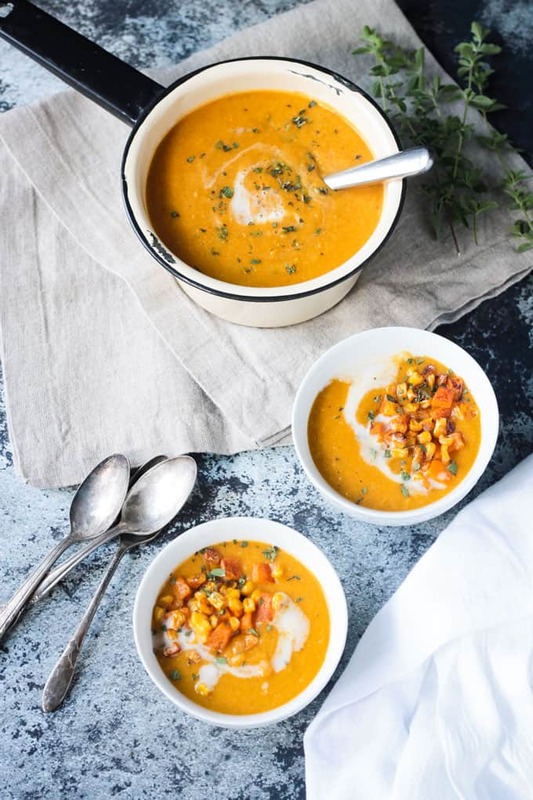 This delicious creamy soup could not be easier to make. The hardest part is peeling and chopping the squash. I’ve gotten pretty good at it through the years and it only takes me a few minutes. Here is a good tutorial for cutting and peeling a squash. Note: I prefer to use my chef’s knife to peel instead of a vegetable peeler, but use what you’re most comfortable with. If you’re worried about it, you can buy pre-chopped butternut squash in most grocery store produce sections these days. While the soup is simmering, I like to roast additional corn and diced squash as a garnish for the soup. Plus, I love the difference in textures with the silky soup and the chunky veggie garnish. This step is totally optional. 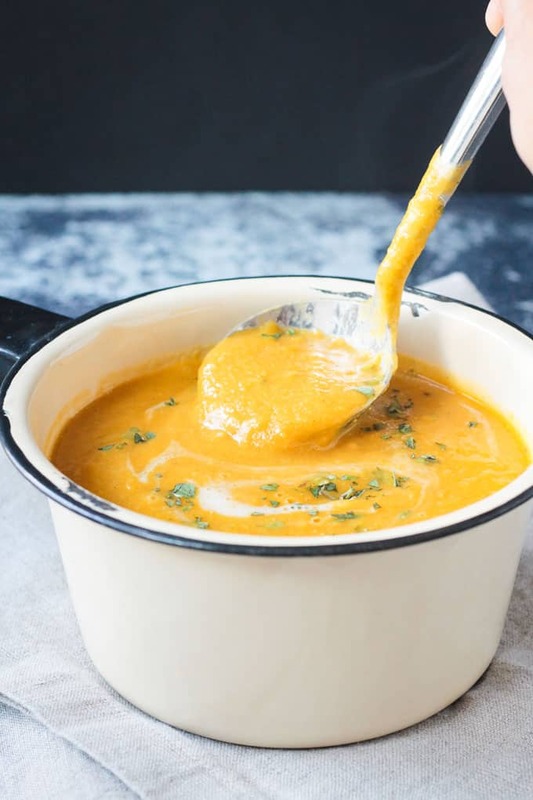 I hope you love this Vegan Butternut Squash Soup as much as we do. If you try it, please come back and leave me a comment below with your feedback and star rating. 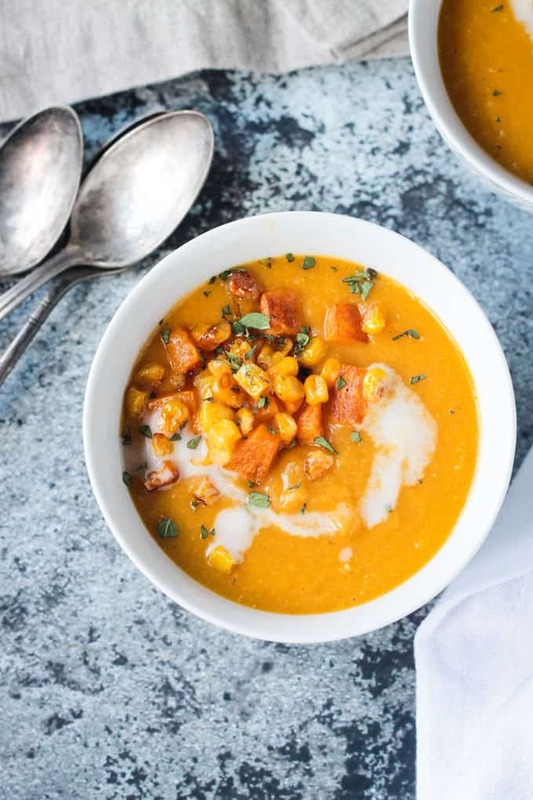 Vegan Butternut Squash Soup w/ Corn - incredibly flavorful with simple ingredients, this cozy soup will have you coming back for seconds. Silky smooth creamy soup base with no absolutely no dairy. Add diced squash, potatoes, corn, sage, thyme, and salt and sauté 2-3 minutes. Add vegetable broth, stir, and increase heat to bring to a boil. Once mixture comes to a boil, lower heat to medium-low and simmer uncovered for 20 minutes until squash and potatoes are tender. Turn off heat. Add nutmeg and non-dairy milk. Using an immersion blender, purée the soup until smooth. Alternately, you can carefully transfer the soup to a blender to purée. Or if you prefer a chunkier soup, you can purée just half or none at all. ~ I like to roast additional squash and corn as a garnish for this soup. I roast about 1/4 - 1/2 cup of each at 400 degrees Farenheit for about 10 minutes. 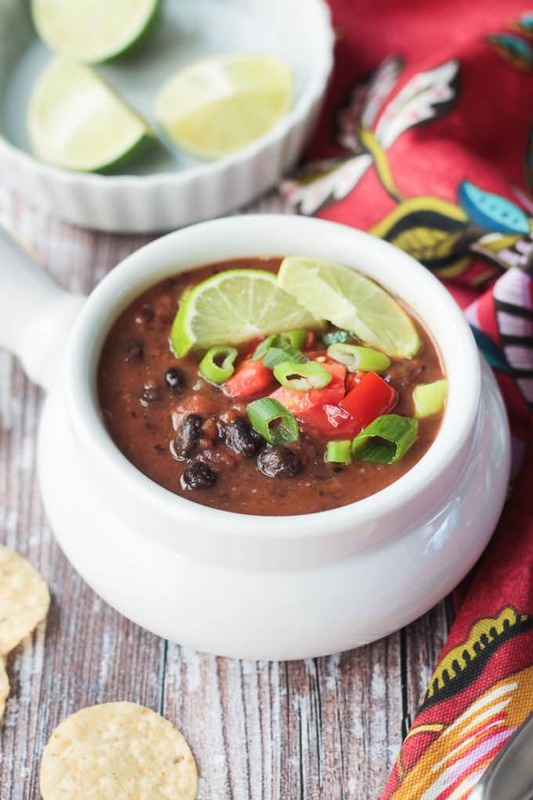 Sprinkle a little on top of each individual bowl of soup just before serving. However, it's delicious as is if you don't want the chunky garnish! *Original recipe posted September 2014. Recipe, photos and content updated September 2018. Mmm, this looks so cozy and delicious! Perfect dinner on a cool fall night! Droooling. I love that you added corn to this, I’ve never seen that before!! Great idea! I’ve been making so many soups lately so I’ll add this to the list! I’m all about the soups too. The corn is sooo good in here – it’s my fave part! I hope you love it, Deryn. Let me know if you try it. 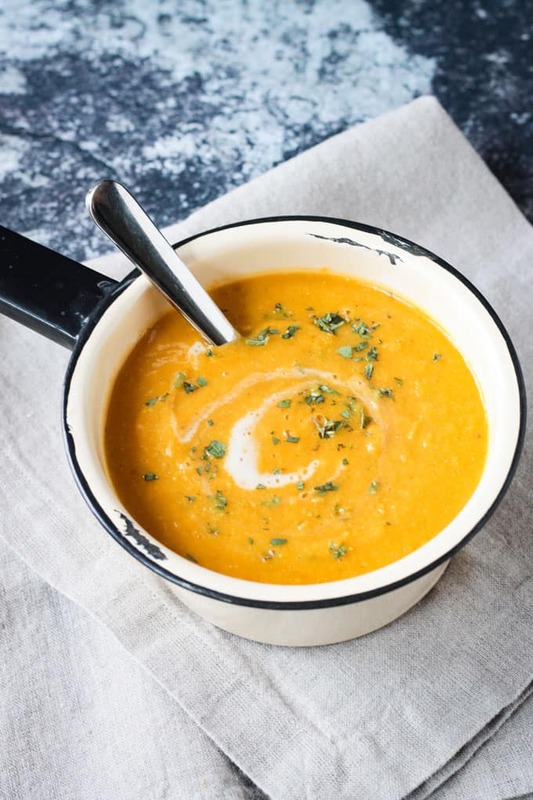 It’s spring here, not fall, but – for me – soup’s good ANY time! PS: What’s a ‘sweet onion’, please? Hi, Natalie. I love soup all year round too! Can’t go wrong. So is your Butternut Pumpkin the same as our Butternut Squash? Or just similar? A sweet onion – like a Vidalia onion – it’s my fave, but any white or yellow onion will work. Hope you love it!